The Commonwealth Bank launched Kaching today. …coming soon. Will launch at same time or close to Apple version. We are committed to both. I was sated. To be fair, they also mentioned that 91% of mobile visits are from iPhone and Android, of which 79% are from the iPhone. This will change over time, but is a rather compelling argument to go iPhone first. 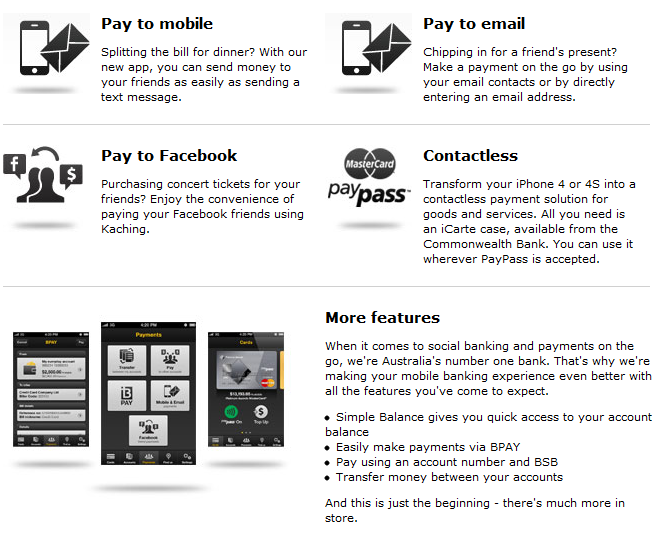 Then I started reading ZDNet’s Inside CommBank’s Kaching post, and the page on Android confused me. Emphasis added [poorly] is mine. 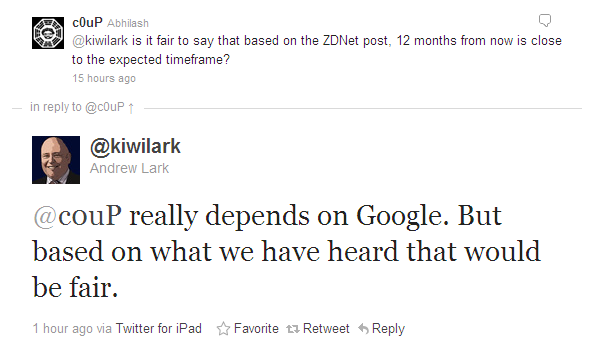 He did say, however, that the Commonwealth Bank had met with Google, who indicated a native NFC chip to be used by the bank would be ready within 12 months, at which time Lark hopes to have a partnership on the way for Google’s Wallet product. “The critical mythology in the market today is that all these Android phones in the market today have NFC chips in them. They actually have ‘dumb’ chips in them, and Google, based on what we’ve seen so far, doesn’t look like they’ll be in the market for at least 12 months with an NFC-enabled phone. “It’s not enough to have the chip in it; you have to have it enabled, and the ‘secure element’ has to be available to us as an institution so we can turn it on for you,” he said. So, no plans for an NFC-capable case. All good, they’ll use the native NFC chips that are available in some Android phones, and go with some sort of sticker approach for the rest? But, uh, what? The current NFC chips won’t work? It’s 12 months away from being ready? Do I need to buy a new phone and chip in a year for it to work? What exactly does this mean? Will the Android Kaching app feature NFC in the next year at all? Maybe I’m just misreading it all, but some clarification would be nice. Yep, NFC capabilities for the Android version of Kaching are more than likely a year away. Also, see @chestmer8‘s explanation in the comments below on why this could be the case. The ‘secure element’ is a thorny issue – the app needs access to it in order to ensure secure communications, but if other apps have access to it they can break the security. My guess is that Android won’t be providing access to the secure element to apps, so you will need to partner with Google Wallet to have access to NFC payment on Android.There are also so many different types of NFC chips that is makes my head spin – I clearly remember someone at Google I/O talking about how they had to choose one type of chip (as emulating them all was impossible/difficult/time consuming), and that as a result of this payments via the NFC chip in android phones was unlikely in the near future. @chesterm8: Awesome, thanks for explaining that! And if that’s the case, is it safe to say the Android Kaching will be without contactless payment for a year, until the Wallet partnership comes through?Also, does that mean a new phone + chip will be needed to access it? Hrm, I am not sure about needing a new phone with a different chip. I would hope not (perhaps all that is needed is for access to the secure area to be granted) but I couldn’t say for sure. Makes me feel less ripped off having a SGSII without NFC! That stuff he said about the hardware/dumb chip is garbage… the Nexus S is available today and has NFC. What are they using for Google Wallet payments then?Security will be an issue, but if they’ve got it figured out with their iCase I’m sure they shouldn’t get too stuck on it. @reece_wagner: Fair point. The chip itself doesn’t seem the issue, but it’s probably closely linked to the secure software side of things? NFI.